WASHINGTON, D.C. -- President Barack Obama has made strengthening gun control one of his top priorities this year, focusing on expanding background checks and a partial assault weapons ban. 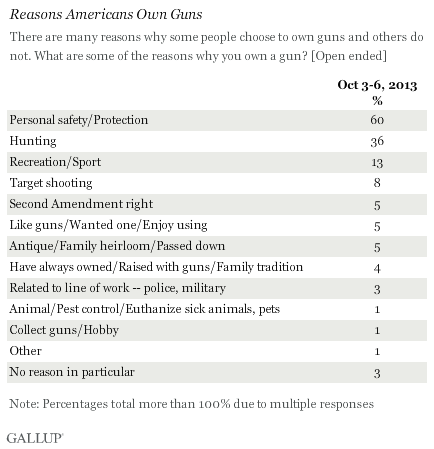 Gallup finds that those who already own firearms mention personal safety/protection most frequently as a reason for ownership (60%), followed by hunting, at 36%. Americans who say they personally own a gun were asked this open-ended question in Gallup's Oct. 3-6 annual Crime poll. These 309 gun owners were allowed to provide up to three reasons they own guns. After personal safety and hunting, general mentions of recreation or sport are third (13%) among the reasons gun owners chose to own a firearm, with 8% citing target shooting. Only 5% of American gun owners cite "Second Amendment rights," despite its frequent use as an argument against gun control. Three percent say they own a gun related to their line of work in the police or military. Collecting guns as a hobby and euthanizing sick animals or pest control had few mentions. Gallup asked gun owners in 2000 and 2005 whether they owned a gun for each of three explicit reasons: for protection, for target shooting, or for hunting. The responses then were mostly similar to those found today, particularly if recreation is combined with hunting. While not strictly comparable, the 2000 and 2005 surveys show that the desire to own a gun for protection is not a new phenomenon resulting from recent U.S. mass shootings. Personal protection is the top reason Americans own a gun, as was true in 2000 and 2005. This, rather than views on the Second Amendment, may explain why moving toward greater gun control, as Obama and many Democrats have sought to do, is so difficult. Those who own firearms for protection may feel that their own personal safety is a vital need on which they do not wish to compromise. Results for this Gallup poll are based on telephone interviews conducted Oct. 3-6, 2013, on the Gallup Daily tracking survey, with a random sample of 309 gun owners, aged 18 and older, living in all 50 U.S. states and the District of Columbia. For results based on the total sample of national adults, one can say with 95% confidence that the margin of sampling error is ±7 percentage points. Less than a year after the Newtown, Conn., school massacre, about half of Americans believe U.S. laws covering the sale of firearms should be strengthened, while a combined 50% say they should stay the same or be less strict.